With a happy surname, it’s hardly a surprise that this novel is fun to read. 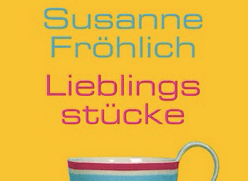 Susanne Fröhlich has written a book about nothing but the daily troubles of a housewife, and there are plenty. She stretches the ramblings and musings out in length. It’s hilarious and takes the reader through family life with friends. Dreading the point where it becomes simply too much, I’m pleased to say she pulls it off without reaching the point of saturation. One time is enough though, for now.